PR Dispatch - PR Dispatch meets - Our new Community Manager! The newest member of PR Dispatch, our new Community Manager, Martha - a non-stop singer and compulsive snacker! After 2 months of interning, Martha has officially joined the team. Home is Hull! (East Yorkshire for those who don’t know) It’s a great place. My star sign is Leo! I’ve not been in London for very long, so wouldn’t say I’ve really got a gem, but my friend Megan and I always meet on a Friday night after work at The Market Porter in Borough Market for after work drinks. The Old Blue Last is another place we tend to go on a weekend! I’m sure after a little longer in London I’ll find some gems. Summer without a doubt! I love winter for coats and boots, but I’m definitely a summer girl. It’s my birthday and I love not having to worry about wearing 7 million layers and keeping dry. There’s also always so much more to do in the sun. 3 things you want to achieve before your next big birthday.. This really depends what is counted as my next big birthday. Let’s say 25. Maybe not an achievement but I’d like to have started paying my mum and dad back for everything they forked out for me for university and life in general haha. I’d also like to have learnt to drive, depending on where I am living at that time and just be in a comfortable living situation and happy with life haha. My headphones! Sounds silly but I can’t go anywhere without my headphones, even 30 seconds to the corner shop. Realisation Par or CMEO collective (I couldn’t pick one), I just thing they’ve nailed their social channels and who they use to promote their products. They’ve kind of gone for the ‘new girl’ of influencer on Instagram so they have such a wide reach – and their products in general are amazing! I’ve recently followed a brand on Instagram called Rose and Grey and I’m obsessed. They’re very ‘on trend’ but have some really amazing furniture and home accessories! I’m really into homeware and interiors at the moment so it’s great for inspiration too. Do what you want until you’re 30. A nurse once told me this, so I kind of believe it. It’s not really a secret, but just be proactive and persistent! Not everything will happen straight away but the more you try the more likely you are to get! 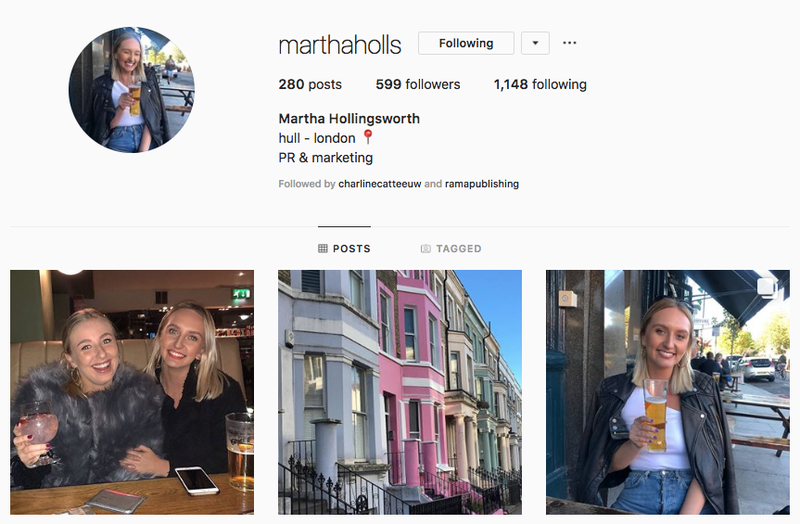 Follow Martha on Instagram here!